The Zelda series to me is more than just a mere game. The stories themselves they have grown over time, however far they stray from each other there is always one thing that binds them together. 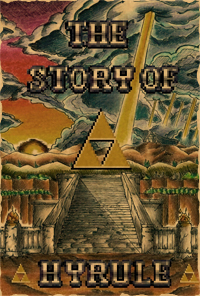 The Triforce...(Regarding those stories, that tells of the Triforce that is). The Triforce is an ideal, a symbol that can reflect reality, every bit as much as it reflects fantasy. I was too young to understand this, though I would not have created The Story Of Hyrule, if I did not hold that ideal true to my self. I would not have had the Power to start, the courage to carry on and the wisdom to find closure.